An official from the Greene County Coroner’s Office prepares to investigate. Scott Halasz | Greene County News The driver of this vehicle was killed after a head-on crash with a box truck Friday afternoon. 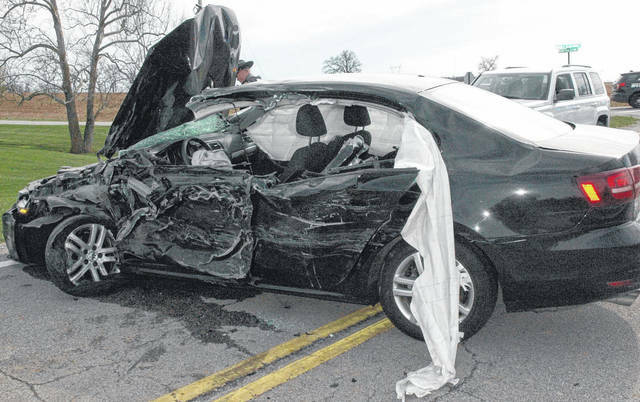 CEDARVILLE TOWNSHIP — A 25-year-old woman died Friday afternoon after a multi-vehicle accident on Wilberforce-Clifton Road. According to Ohio State Highway Patrol Sgt. Matt Cleaveland, Shavonne Jane A. McDowell, of South Euclid, was westbound on the road near Cedarville-Yellow Springs Road and for an unknown reason went left of center, where her vehicle was hit head-on by a small box truck shortly before 3:30 p.m. Two people traveling in another vehicle stopped to pull McDowell out of the vehicle, Cleaveland said, but she was pronounced dead at the scene by paramedics. He added that McDowell was not wearing a seat belt and likely caused the crash. “At this point the information leads us to believe she’s at fault,” Cleaveland said. Two of three people in the box truck were taken to Greene Memorial Hospital with non-life threatening injuries. Cleaveland said the Greene County Sherrif’s Office and the Cedarville Township Volunteer Fire Department EMS aided troopers at the scene. The accident is still under investigation. 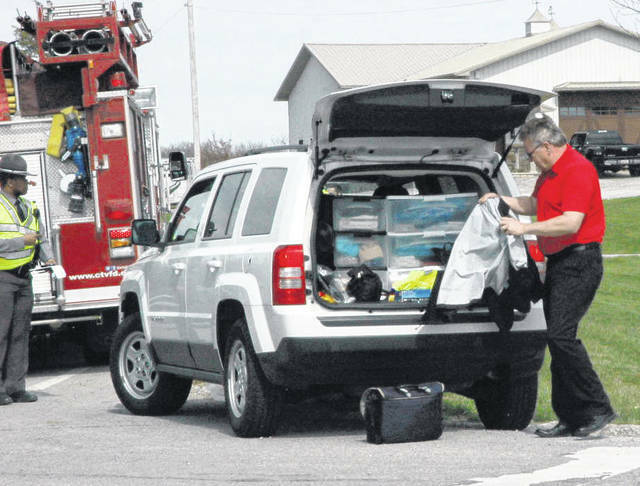 https://www.xeniagazette.com/wp-content/uploads/sites/32/2019/04/web1_DSC_6727_ne2019412175923936-1.jpgAn official from the Greene County Coroner’s Office prepares to investigate. https://www.xeniagazette.com/wp-content/uploads/sites/32/2019/04/web1_DSC_6728_ne2019412175925569-1.jpgScott Halasz | Greene County News The driver of this vehicle was killed after a head-on crash with a box truck Friday afternoon. Contact Scott Halasz at 937-502-4507.